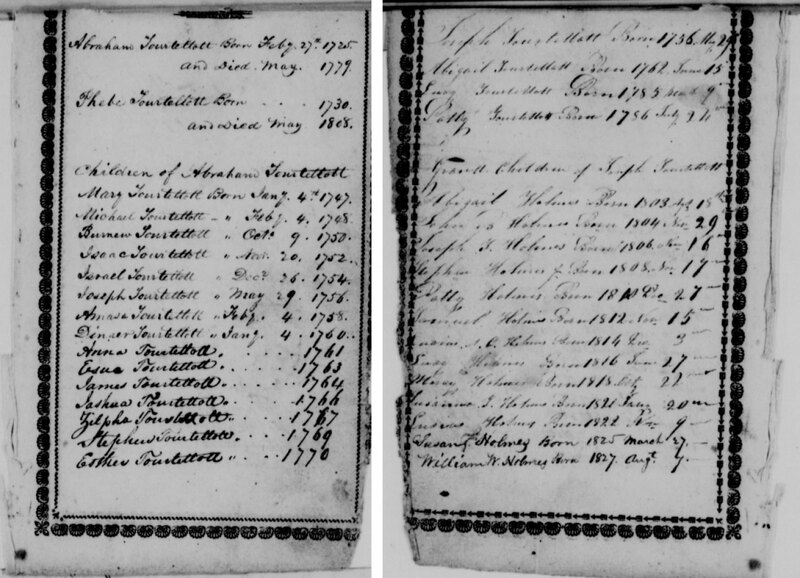 Sheilagh Doerfler’s recent post about finding Revolutionary War ancestors reminded me of the story I tell people about how much I love Revolutionary War pension records. They often contain significant genealogical information—but the first time I ever consulted these records, they yielded much more material than I ever would have expected. In the early 1990s, I was doing the paperwork do get my father into the National Huguenot Society by right of his descent from our ancestor Abraham Tourtellotte (ca. 1655–ca. 1704) of Newport, Rhode Island. (I could not join then because I was not yet 18 years old.) The American generations went from Rhode Island—specifically, from Newport to Providence and Glocester—into Thompson, Connecticut, in the northeastern corner of that state. They generally stayed within a few towns of Thompson afterward. As I began to obtain every birth, marriage, and death record, I struggled to find the birth of my great-great-great-great-grandmother Lucy Tourtellotte. Family papers indicated she was born at Thompson on March 9, 1785 (one year before her parents’ marriage on May 6, 1786) and that her daughter Lucy Holmes was born there on June 27, 1816. I visited NEHGS, where a staff genealogist recommended I check Virgil D. White’s Genealogical Abstracts of Revolutionary War Pension Files because Lucy’s father, Joseph, had served for Connecticut. The abstract itself was amazing, but fold3.com now has digital images of the actual pension record, shown here. Revolutionary War pension record of Joseph Tourtellotte, as viewed at fold3.com. After this extremely fruitful first experience, I always check the pensions! I found wonderful information in a Civil War pension file for the family of my gg grandfather who was killed in the Battle of Cedar Creek, VA in 1864. He left a wife and five children who, at the time of the pension filing, were in Putnam, CT. There was information about the children’s full names and accurate birthdates that I couldn’t find anyplace else. I published a book of my gg grandfather’s Civil War letters and this information helped “flesh out” the appendix on the family members, including his parents. It also told me that neither his mother nor his wife could read or write as their affidavits were signed with their “mark.” They were both born in England so this was not unusual. In another search for a Revolutionary ancestor, the pension record had copies of Bible pages which allowed me to establish a link between generations and also the correct spouse of one of the children. It was a wealth of information. In some cases the actual Bible pages might be there or original records, they didn’t have handy copy machines in those days when proof was required. And there is sometimes later correspondence regarding genealogical requests that got filed into the veterans’ record — and then microfilmed! Clues about where to go next. So, here’s thanks to the Rev. Frank Grant Lewis, Baptist minister. His letters in the David Paine of Caroline, New York (and earlier of Freetown, MA) file led me to the Newport Historical Society and to the then DeWitt Historical Society of Tompkins County, NY which had more of his correspondence. Though, drat, not copies of what they had sent him in the early to mid-1930s, providing information they do not have now. And, second drat, none of that made it onto the five-foot shelf of his stuff at the American Baptist Historical Association, excepting a memoir which focuses genealogically speaking on his wife’s New York ancestry. P.S. The ABHA is another underutilized resource for information about ministers and churches. Google, of course! Did Mr. Garrity mean American Baptist Historical “Society’ (vs. “Association”)? Need to check with them about any new Rev. Lewis material. Not much hope, but it costs only a byte to ask, and not a First Class stamp plus envelope. I’m a descendant of Joseph’s aunt Sarah Tillinghast who married John Inman. I guess that makes us about 6th or 7th cousins. It’s a fascinating family, especially with the connection to the amazing Gabriel Bernon. I see that as of 1990, Joseph wasn’t listed in the DAR Patriot Index. I hope you’ve proven the line in the SAR, and can convince a female relative do the same to get old Joe into future copies of the DAR Patriot Index. I’ve got the 40 page + Rev. War pension file for my Waggoner many-times g grandfather, full of genealogical information. Your post suggests searching for the file of another ancestor, Enoch Jewett (1857, Lunenburg, Worchester Co, MA – 1849, Hollis, Hillsborough, NH) might solve a mystery. I’ve found a town history of Hollis, suggesting Enoch served with Washington at Valley Forge. Washington sent him with a group of others to NH to tap trees for maple syrup to supplement the meager rations. While there, Jewett went through Hollis and decided he’d settle there after the war. He did, and married a Lydia Pike in Dedham, Mass, and among their children were a Moses and an Enoch jr. This Moses was my ggg grandfather, and I have his dates, wives, and places of residence documented. The problem is that in the same town history, Moses is given a different year of birth, place of residence, and is given one of his brother Enoch’s wives. The Jewetts were famous/notorious for naming their children after people in prior generations, so there are multiple Jewetts named Moses and Enoch born within 10 years of each other. Online family trees simply assume that my ggg grandfather Moses, whom I can document, b Hollis in 1788, d. Cleveland 1850, is the son of Enoch and Lydia. I feel a need to find a trail that documents the relationship, and so far, haven’t found proof. Maybe Enoch’s Rev. War Pension file would hold the clue. I am becoming more and more aware that I need to include military records in my research NOW, instead of postponing as I’d planned (not realizing the wealth of information they can contain). Thanks, Chris, and thanks to the rest of you for the nudge your stories are giving me to get on the ball! If a soldier died on a British prison ship, and his wife remarried, would she still be eligible for a pension? Five of their children moved to Chenango County, New York, why? Bounty land? One of the sons was a veteran, too, and his grave has a SAR medallion. I descend from the youngest son, and his grave site is not marked, cannot be located. Would the county courthouse be likely to have any information? I am also researching Tourtelotte’s in the Glocester area. My gg grandmother, Nancy Tourtelotte Young, b 1827 in Glocester, was daughter of John Young and Harriet or Hannah Hudson. A John and Hannah Young are buried in William Tourtelotte’s lot in Chepachet, Glocester, RI. Are they Nancy’s parents? What is the Tourtelotte connection? Did either John or Hannah have Tourtelotte ancestors?